Travel Feature: Golden Door. Plus Wellness Tips + Spa Recipes! 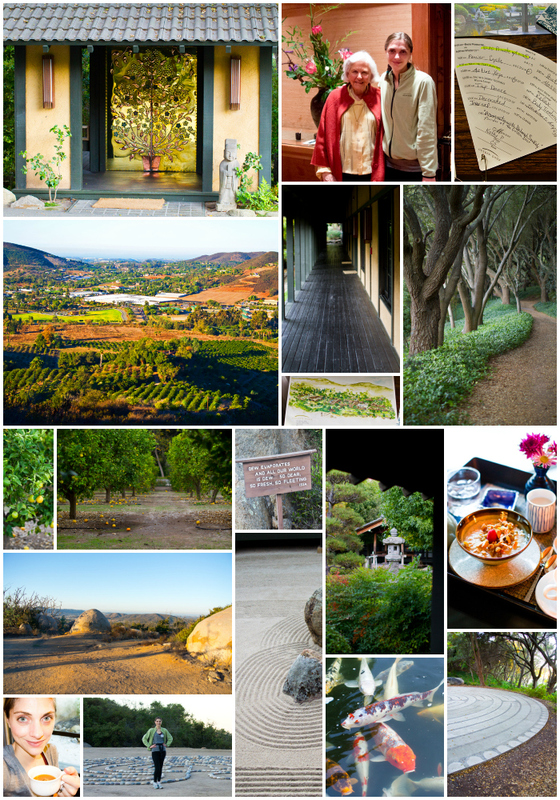 Recently, amidst the chaos, stresses and frenzy of everyday life, I was ordered to pack my bags, kiss my husband and kitty goodbye and escape to a wellness retreat like no other on earth. 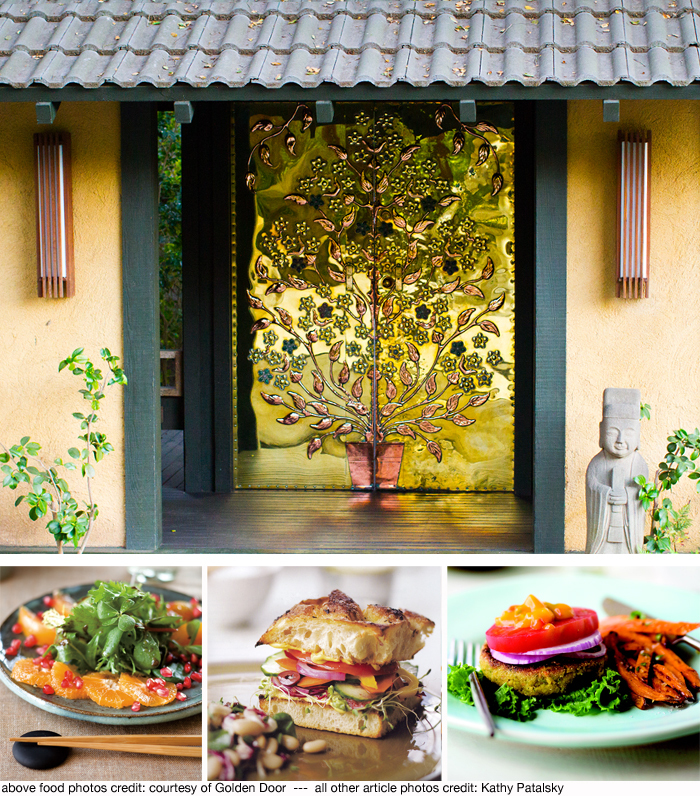 Golden Door in Escondido, California. The Basics. 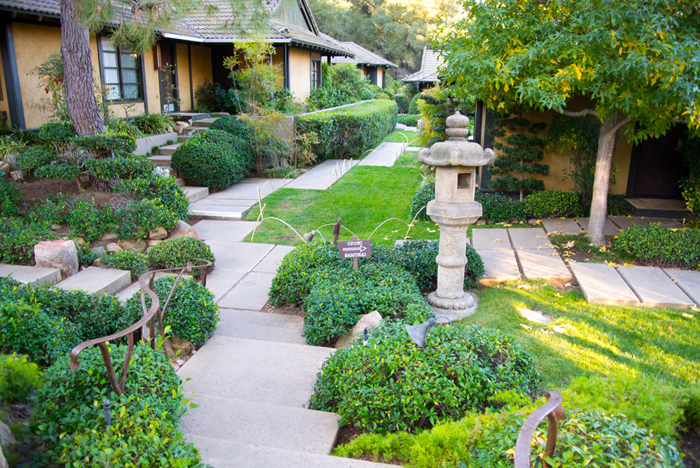 Golden Door is an all-inclusive spa retreat, built on a 377-acre piece of land in southern California. 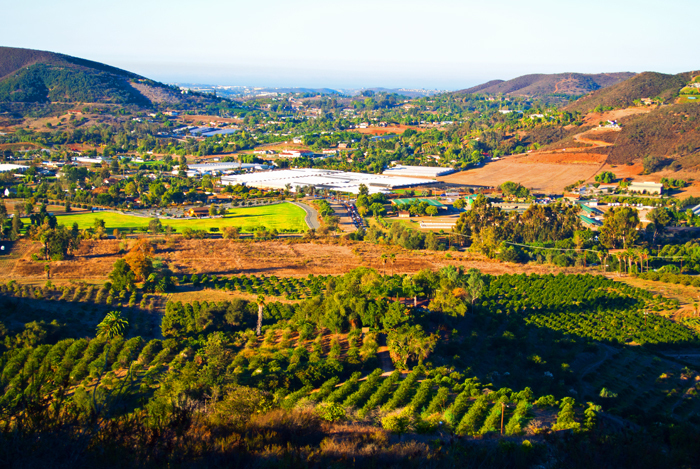 You will find rocky cliffs, vast hiking trails dotted with pomegranate and avocado trees and a large citrus grove out front. I was thrilled to get a taste of “The Door” for a 3-day session. Most guests stay for the full 7-day week, but 3 and 4 day stays are available. You are assured a perfectly pampered stay because the resort hosts a maximum of 40 guests per week, with a 1:4 guest to staff ratio. Among its rumored VIP guests of past, Oprah, Martha Stewart, Steve Wynn, Barbara Streisand, Julia Roberts and more. 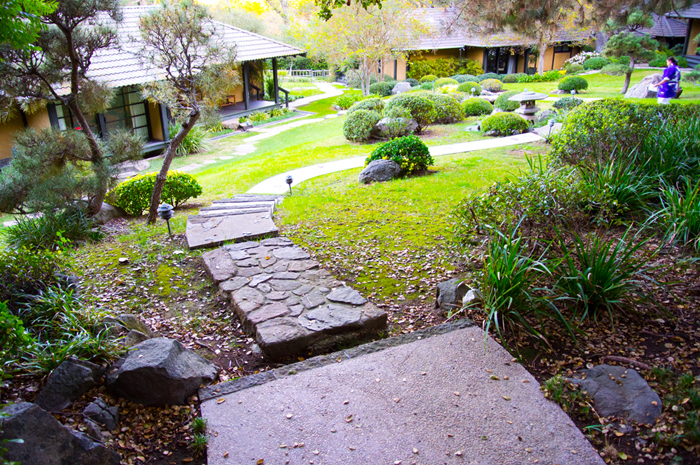 During your stay, you receive not only your luxurious private room with your own garden deck or patio, but you also receive a personalized fitness program, personal trainer sessions, guided hikes, access to a wide array of daily fitness activities including Power Yoga, Zumba classes, aquatic workouts, dance classes and many more. Every week changes, for example, Dancing with the Stars dancer Karina Smirnoff taught dance in 2012 for Dance Week. 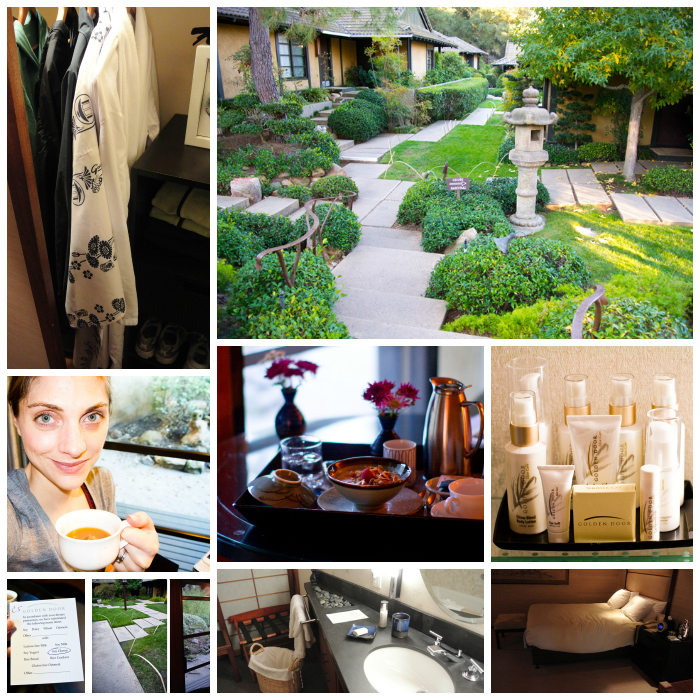 Inside your room is a week’s worth of clothing, Golden Door skin care and bath products, robes and spa shoes. Minimal packing on your end. 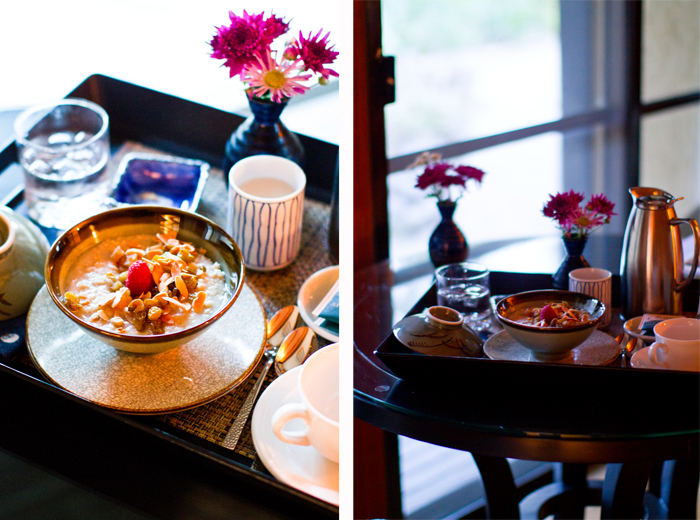 You also receive three healthy (delicious) gourmet meals a day created by Executive Chef Curtis Cooke and his team. Plus plenty of snacks, beverages and appetizers. Your meals are tailored to your dietary needs – or just your likes and dislikes. If you hate eggplant, it will not grace your plate ever! My vegan diet was perfectly accommodated. In addition to fitness, cuisine and room accommodations you will also receive daily skin care sessions and massage sessions. From facials and body scrubs to massages and pedicures. You will truly be pampered from head-to-toe during your stay. I hopped in my car and jetted down the dusty 5 freeway, traveling from LA to San Diego County. It was an easy two hour drive. Finding that hidden golden door entrance was the most challenging part of my drive. Once, twice, three times I drove past the understated gate. But after a few car horns being honked my way as I navigated slowly to "The Door," I finally made my way into the grounds. 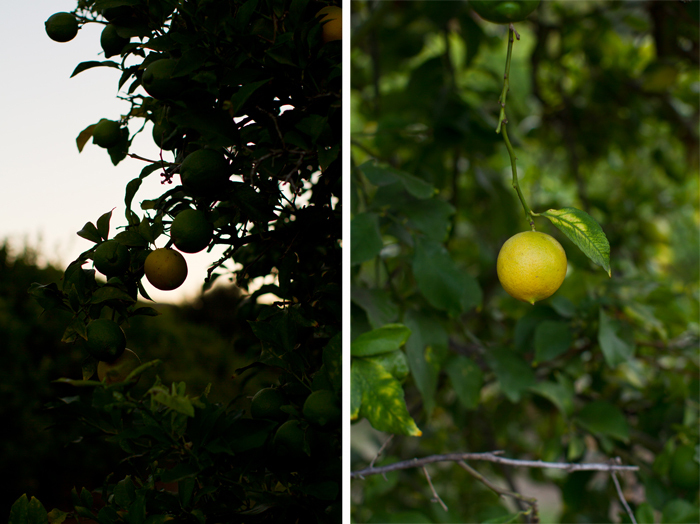 I descended along the winding, lantern-lined driveway, a grove of citrus trees to my right, ripe with fruit. I dropped my car off at the valet and was greeted by several wide smiling faces kindly asking me about my journey. I entered the Japanese artwork-adorned reception area and an intoxicating aroma of orange blossom greeted me. Woozy from the transporting fragrance, coupled with dim candle-accented lighting, I plopped down on the comfy couch. I let out a deep breath and tore off my dark sunglasses, just as an opaque porcelain cup of warm tea was handed to me. I checked in, and was given a take-home canvas bag filled with a BPA-free water bottle, my room key and my "fan." (These “fans” are your new best friend.) Forget your cell phone and just follow the fan. They include your schedule for the day. You do not need to remember a thing, just look at the fan and let “spa brain” take over, clouding all anxious thoughts and blocking any appointment-remembering skills you may have. Upon arrival, guests meet with a fitness coordinator to plan out their many, many, many class and activity options for the week. I settled into my chair as a lovely woman pulled out a large (very filed) sheet jam-packed with activities. She went through each activity to discover my preferences. Yoga? Yes. 5am hikes? Sure, why not. 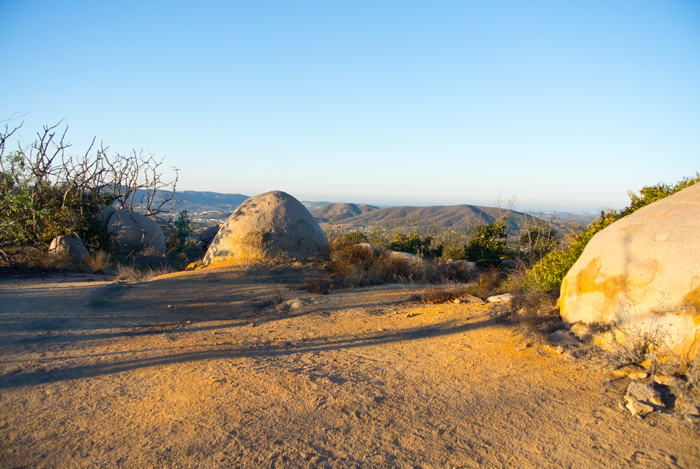 (Wait, did I really just agree to hike up a rocky, dusty, giant hill at 5am? Oh my.) Archery? No. Wait, maybe? Journaling? No. Spinning? Sure. Nutrition lecture? Yes please. Dance classes? All of them, yes. Zumba? No. Zumba is great! Ok… (They have everything from a drum-dance-class to a running clinic and even Tap.) Body sculpting? Maybe. Meditation walks? Sure. And on and on. 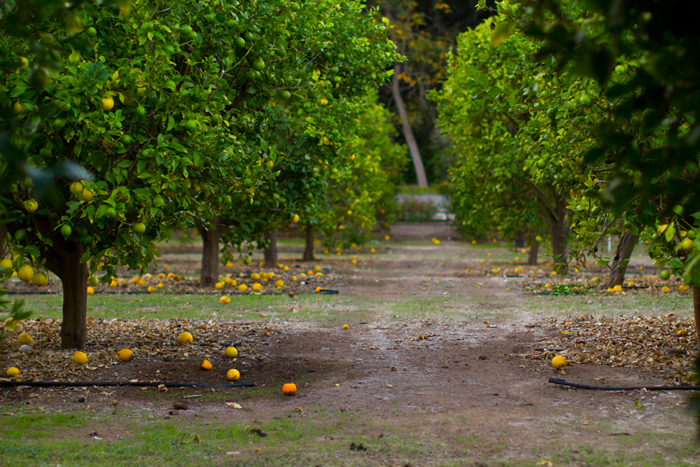 My eyes as wide as the oranges in the orange grove out front, I meekly squeak out this sentence. "So... if I don't want to do some of the classes on my schedule.. Or sleep in...?" She smiles widely and tells me I can whack that snooze button and stay in bed all day if I'd like. They call it DYOT (do your own thing.) It all depends on your goals for coming to “The Door.” Some come to lose weight, some come to kickstart fitness and healthy eating, some simply come for some R&R and to get away from it all. From ZEN to Zumba, you do as you please. Then somewhere between deciding if I wanted to take Zumba or tap class and what ‘personality’ of fitness trainer I liked. I must have looked a bit overwhelmed because she said to me something along the lines of, “I think I have a good idea. So since you do not have specific preferences for scheduling, we can just let fate decide. Aka, “The Door Gods.” There is always magic in “The Door!” I nodded my head and liked that plan. Less deciding, more adventuring. I was then lead on a grounds tour and given some more need-to-know newbie info. 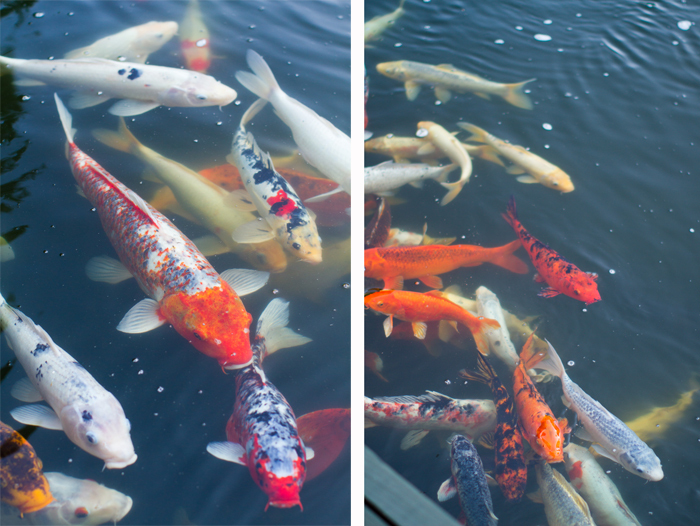 Along my tour I saw the Koi pond.. 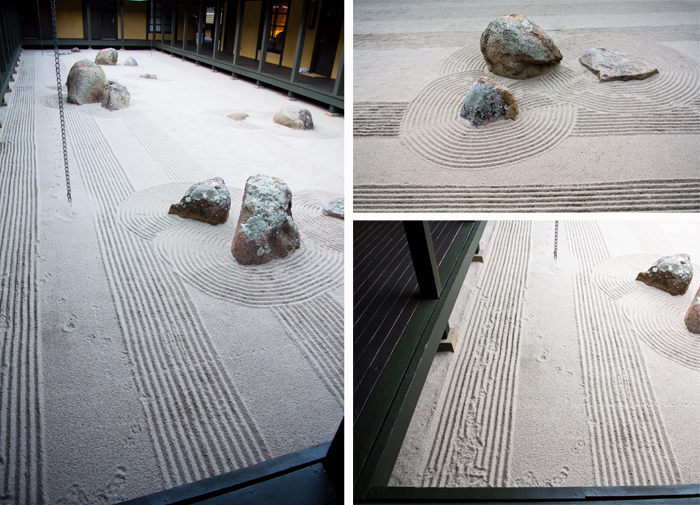 Sand garden (tiny critters from the forest make footprints sometimes.).. The amazing Labyrinth. You walk it slowly as a form of meditation. 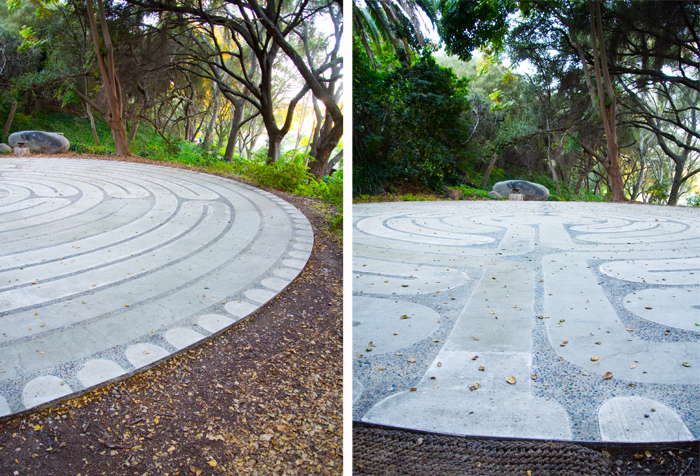 Golden Door's Labyrinth is an exact replica of the Chartres Cathedral floor labyrinth..
Love these fishies. 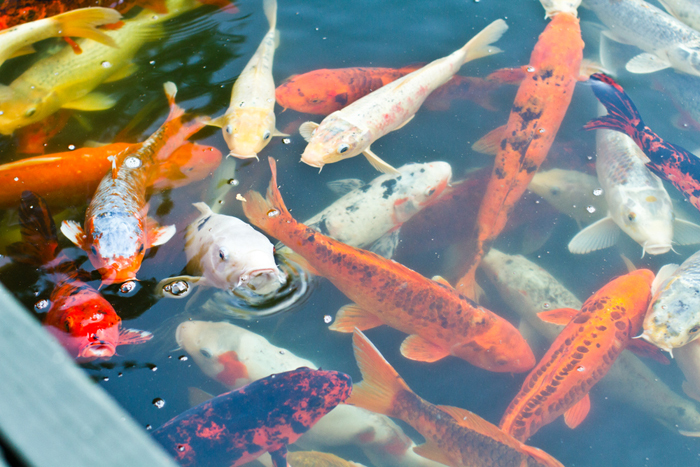 In japan they treat their Koi fish the way we treat our cats and dogs. Pets!.. I was told that the normal day goes like this: Wake around 5am, dress and have a light snack offered in a lounge. 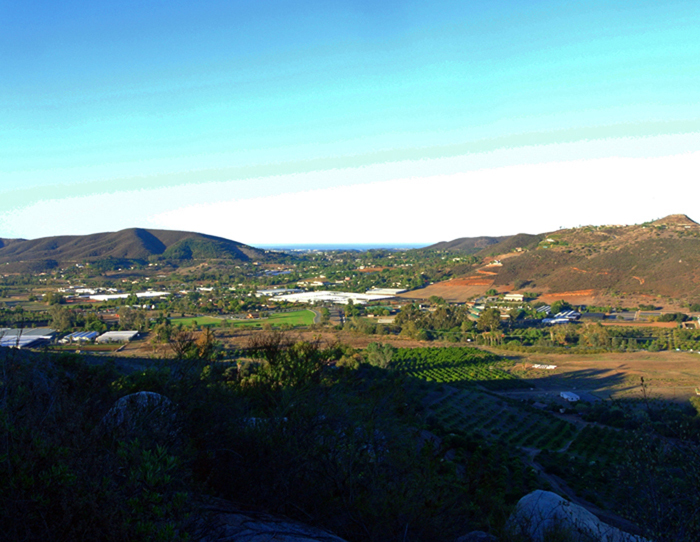 5:30-7:30 AM hike. Return to your room where your breakfast will be waiting for you on a tray along with your schedule “fan” for the rest of the day. (Wait, didn't I just do a two hour hike? More fitness??) Yes! After your breakfast you can enjoy more classes. Yoga, Water aerobics and more. Or not! You choose. Then lunch is around 1pm And more classes after that. And somewhere along the way you are treated to daily facials, scrubs and a daily massage. Then dinner in the dining hall which has a lovely fireplace-adorned lounge for appetizers, and a beautiful fish-filled Koi pond out back. 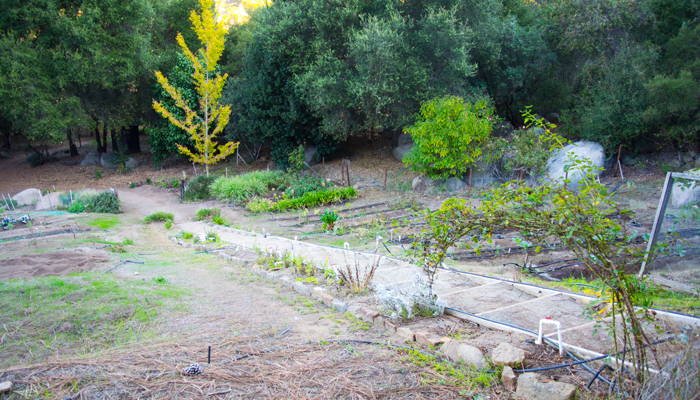 I was shown the vegetable gardens out back. 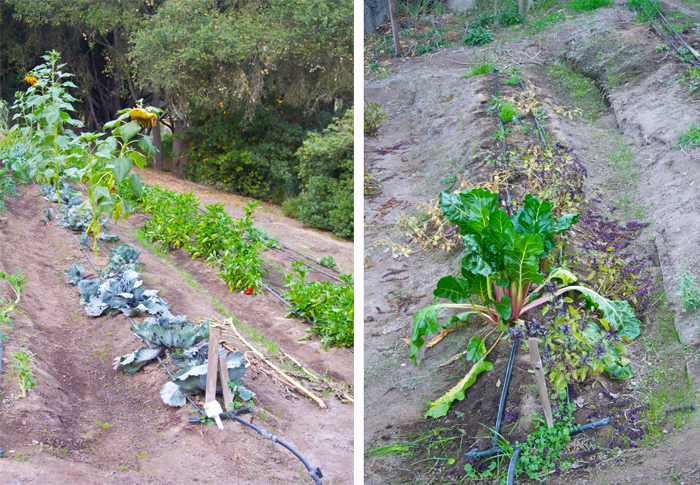 "Grow your own food" is proudly practiced. 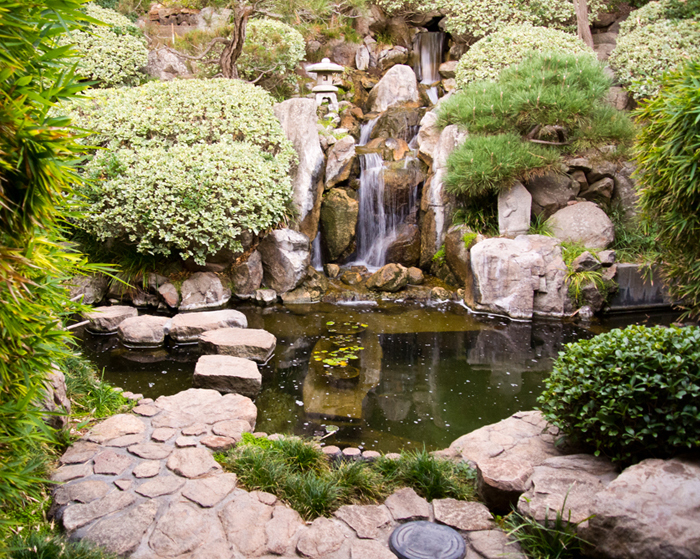 The grounds include tall oak trees, bamboo, curved manicured paths and bridges, rocky waterfalls, a groomed sand garden and candle-lit lanterns everywhere. The large granite lanterns were brought over from Japan. They are shipped in sections and stacked upon arrival. 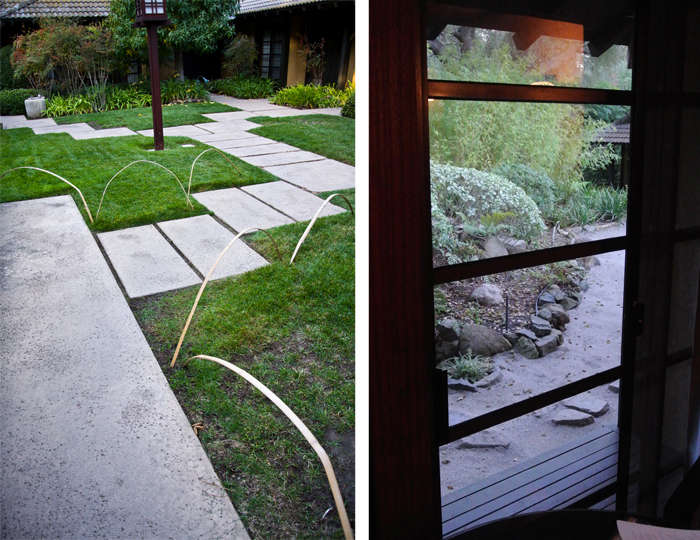 The entire resort is in Japanese style - inspired by Deborah's travels to Japan. Fun Fact: Have you ever noticed how most paths or bridges in Japan are curved and not straight? This is because some cultures believe that “evil only travels in a straight path.” So it cannot follow you when the path is curved. Waterfall. Hidden "spots" around every corner..
Back from dinner. I met the other guests and I think 90% of them are return visitors. A few ladies have come 20-50+ times. Wow! Everyone just raves about how much they love this place, so I am more excited than ever. 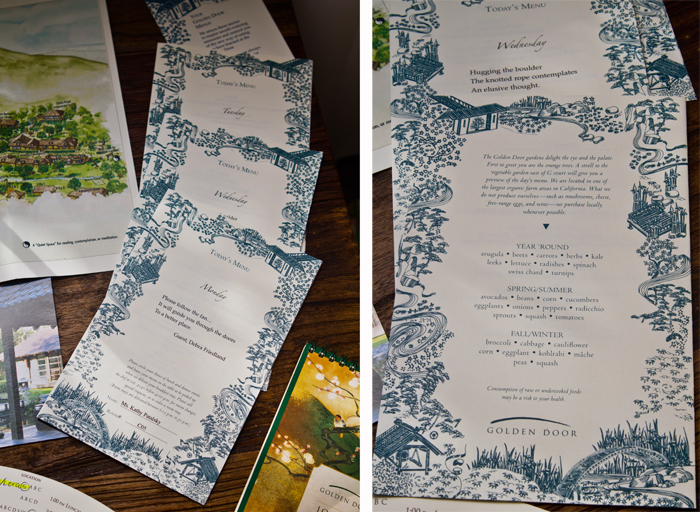 At dinner, little place-cards were set out to indicate vegetarian, vegan and gluten free guests. Easy. Seamless. I was served tofu with red quinoa and veggies like snap peas (grown in the Golden Door garden.) The starter was a soba noodle dish and dessert was fresh blueberry sorbet. A hot pot of green tea, agave and lemon to finish. After dinner we took the habitual walk up the front road to “knock on the front gate” then back down again. Lastly, we were treated to optional mini massages, before returning to our rooms which had been turned down and prepped for sleep. As I walked back to my room in the cool, crisp air, I floated along the quiet paths, past the glow-y, twinkling lanterns. Everything was calm. I am already feeling the swoon of the Golden Door take over my spirit and I can't wait to see what sunrise brings. I just set my alarm for 5AM. For the mountain hike that starts at 5:45AM. I hope I make it. 5AM alarm. Yes, I actually got out of bed at this hour! 5:30AM tea and banana. Then off for a 5 mile hike up the mountain. It was lovely watching the dark navy sky turn periwinkle then purple then pink, gold, cream and into a daylight blue. 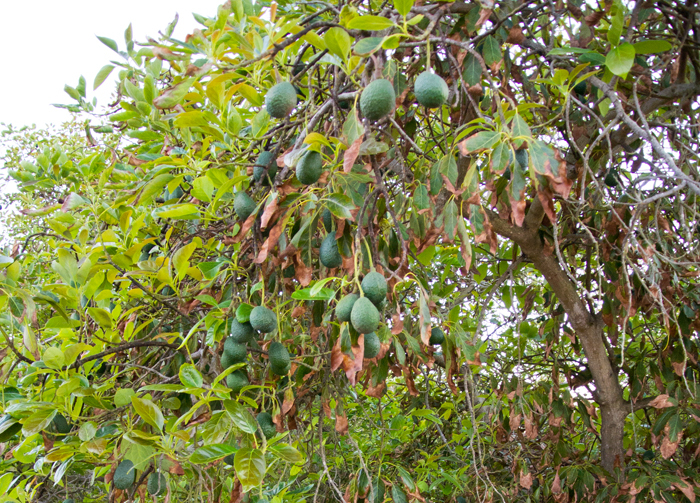 As you hike, you are literally kicking avocados the whole way up, since the hillside is accented with avocado trees. As well as pomegranate trees and a few other fruits. The dusty fall path was accented with gray and beige stones, crumbly rocks and dry brush, with a few peeks of cool green meadow moss along the way. You can walk solo or chat with friends or fellow guests. 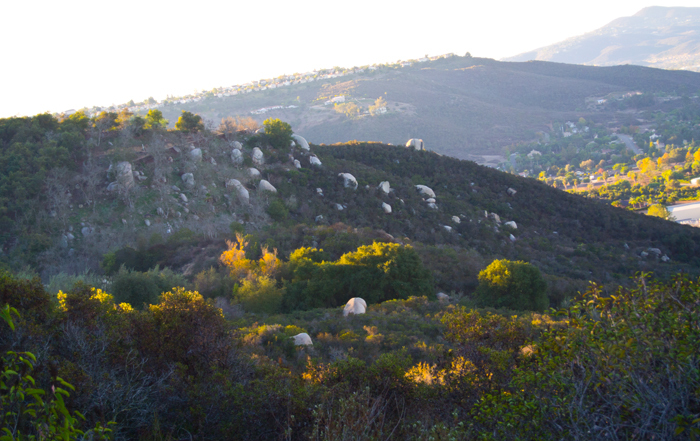 The sunlight is so gorgeous hitting the rocky cliffs in the morning air..
Avocado trees line the hiking trails.. The hike ended around 7:30AM. In my real life, I wouldn’t even be out of bed yet. Breakfast in my room was very welcome, as I found I was quite hungry. Fresh fruit, nuts and hot tea. Soy milk. Light, but filling. After breakfast I was off to start my first day of activities. First up, my personal trainer introduction. I met with a bubbly young trainer with blond hair and bright sparkly eyes. She was in a pink jacket and gave me a big smile. We did a thirty minute chat on my fitness goals, problems, classes I don’t want to miss, etc. She was great. She showed me a stretch on a “foam roller” that I will be doing at home for sure. Next I, reluctantly, went to Spin class. I was pleasantly surprised in how much I enjoyed it! A superb instructor can make all the difference in any fitness class. Plus, I was sweating! Next up was Power Yoga. This was a great way to calm my mind and meditate on my body and how it was feeling. Then I went back to my room for a hot bath. After that was lunch. I had a grilled veggie and vegan cheese (yes it was really vegan) sandwich on a homemade focaccia-style grain bread. Some pesto oil on the side and creamy cauliflower puree soup. 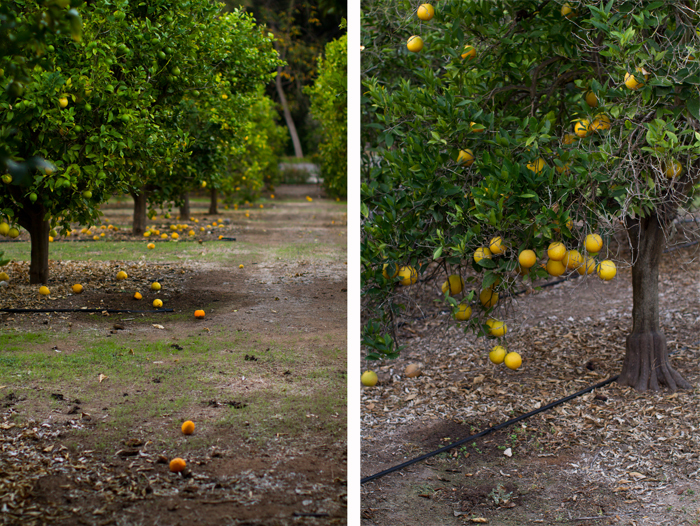 Fresh oranges from the orange grove too. Served with lemon-infused water that was incredibly refreshing. I was happy to sit poolside, under the warm sunshine and lush surroundings and engage in some light-hearted chatter with a bubbly group of ladies. Everyone is in a friendly, cheerful mood. I think it is impossible to be anything but calm and happy here. After lunch I did a “posture improvement” class. Another excellent instructor. The staff is so amazing it is really hard to describe the warmth, skill and helpfulness each one of them communicates during your stay. Then back to my room for my first in-room massage. Amazing. I went from tense and tired to a warm puddle of relaxed mush. Then at 4pm my activity card said: 4pm: Relax. So that is what I did. Dinner. The starter salad was kale, avocado, pine nuts and radishes. All my faves! The entrée was a spicy chickpea stew with plenty of veggies and some couscous as well. Really soothing. Dessert was a banana-pear tasting vegan gluten-free cake. I was so pleased to find so many guests with special diets and meal preferences. Some had much longer dietary guideline lists than me. After dinner was the highlight of my entire GD adventure. Deborah Szekay presented a small, informal chat all about wellness, life and more. She is 90 years old! And amazing! Deborah and I. Love this Wellness Warrior (WW is her newest project!).. After the chat I gave her a hug and grabbed a snapshot with her. She is such a lovely woman and I wish you could all sit down and hear her speak. 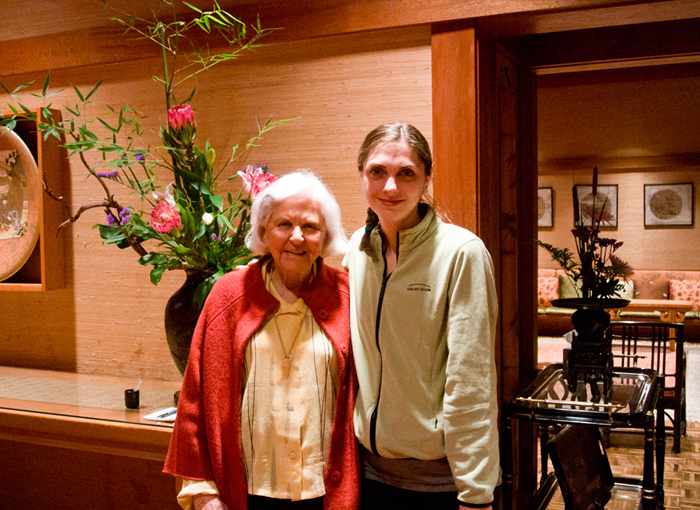 A few things I learned from her..
1) Three things for wellness: 1) respect the body. 2) oxygen / exercise and movement. 3) Food / nutrition. 2) Have a habit of silence. 3) In the morning do three things before you get out of bed. 1) wiggle. Feel your body and become aware of it. 2) breathe. 3) shout “good morning!” Send that positive energy out into the world and believe in it. 4) As you age, moving from “the big house” to “the small condo” can contribute to aging. If you are moving less, and have less “stuff” to do you will not be using your body, allowing the muscles to move and oxygen to enter the body and brain. If you do downsize, be sure to make up that loss of movement through plenty of added activities and exercise. 5) On meat and animal suffering. Deborah described how animals have mood chemicals too. Just think of your cat or dog when you come home to greet them. They get giddy and bliss-filled. Happy endorphins and hormones. The same goes for sadness and stress. Animals’ bodies produce stress hormones just as we do. “Meat is tainted by the suffering of animals.” Meaning that when the animals lived, the severe stress and unhappiness they experienced “tainted” their flesh. Thus, eating a living creature that lived a life of pain and stress is passing on something unwell to your own body. She then admitted that there has been no study on her theory, but she is very passionate about believing that there is something to it. Oh, and she also said “cows have dignity.” ..Oh boy do I love her. Day Three. My alarm went off at 5AM. Somehow all the fullness I felt from dinner last night (good fullness!) has disappeared and I knew my body must have been working overtime while I slept to re-fuel from my active day. I felt super sleepy and almost hit that snooze button. But instead, I pulled on my hiking shoes and jetted out into the dark morning to the lounge where coffee/tea and fruit is served before the dawn hikes. I grabbed a banana and some green tea. The sky was a beautiful deep ocean blue, the sun slowly pulling itself above the distant ocean and trekking its way up the hillside, leaving fuzzy splatters of pink, gold and orange. ..uh-oh, now I’m speaking in metaphor and quotes. This Golden Door Spa-ness is really seeping into my brain. They call it “SPA brain.” I totally have it. I can’t remember to check my blackberry or what is next on the schedule, but funny enough all the important stuff milling through my head is so clear and rich. The buttons on my camera, the blinking light on my cell phone and the fuzzy glow of my iPad screen – they all look so foreign and cold to me right now. The warmth of smiles, the crisp forest breeze and the quiet sound of a distant waterfall creating music is what feels much more familiar and welcoming. Healing and calming. The simple things that we take for granted – like a hot bath, steamy tea or coffee, the first bite of a freshly cut orange or strawberry – these things resonate in such vivid colors, tastes, temperatures and textures to me here. Why ruin this feeling of bliss by checking my cell phone. As I write this, I can even feel a difference in the way my thoughts move through my head. While on day one I was rigidly charting my day, scribbling down what I did and saw and ate, today my thoughts are like flowing water. They flow. And that reminds me of the quote from yesterday’s hike..
“Nature never rushes, but it always gets the job done.” ..not the exact quote, I’ll blame it on spa-brain. But you get the idea. 9PM Another day passed. It was pure bliss. I tried Zumba for the first time and LOVED it. The instructor was so fun and talented. I think I will have sore facial muscles from smiling and giggling so much during that class. My trainer showed me some super strength training and stretching techniques to combat my heavy computer and camera use. Lunch was Portobello enchiladas with beans and veggies. Vegan. Iced tea and a vegan oat cookie too. Perfection. The “ahhh” portion of my day included another amazing massage, a pedicure, herbal wrap and deep cleansing facial. Every staff member is exquisite in their skill. Dinner tonight was beets and greens with crushed pistachios. Then my entrée was a sort of brothy Moroccan stew with capers, kalamata olives, golden raisins (they love golden raisins here!) and a slightly spicy tomato broth. I also tasted some lemon, maybe? It was divine. Topped with large chunks of herb-crusted tofu and fresh pine nuts. Dessert was the famous “chocolate avocado pudding.” (recipe link below!) It had sliced almonds, cherry syrup and soaked dried cherries over top. I also finally tried the “fresh ginger” tea everyone kept raving about. The recipe is simple (I was told) just some ginger blended with water in a Vitamix and strained. Then that ginger extract is used to make a sort of tea. Not sure if it is lightly sweetened or not, but it was good. I added some lemon to mine. Chef Cooke gets five golden stars from me when it comes to the cuisine. And he takes your feedback and requests VERY seriously. All you have to do is speak up. Finally, by the end of my second full day, I have learned one thing. In the words of a guest. “At The Door, you just ASK.” (And it happens.) True. True. True. 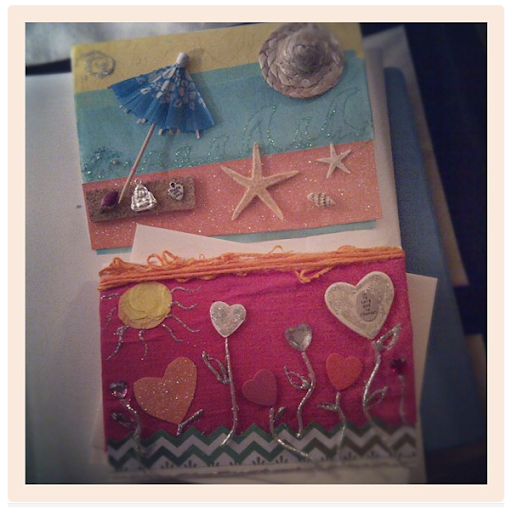 After a very fun evening activity of card-making, it was off to bed. Back to reality. I skipped the hike today since I wanted to get a few more photos in the morning. 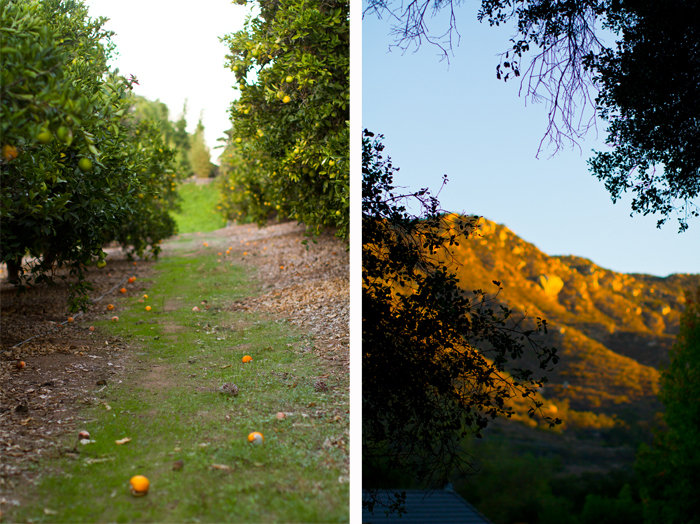 Just after sunrise I strolled around the quiet citrus grove out front. I spotted a little brown bunny hopping along one of the paths. I adore the wildlife all around me here. 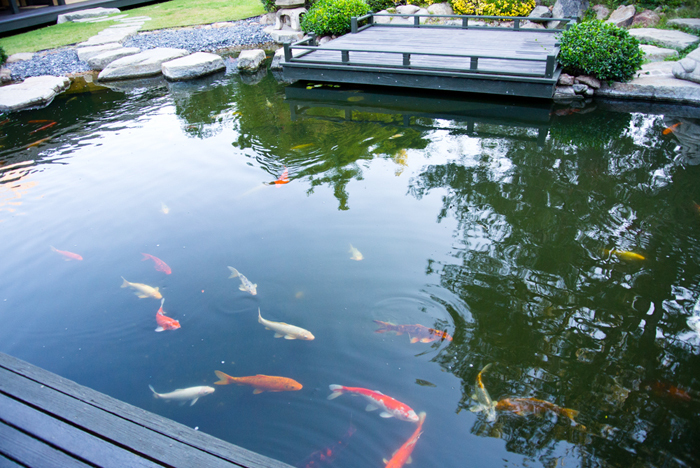 And then over to my favorite spot: the Koi Pond. 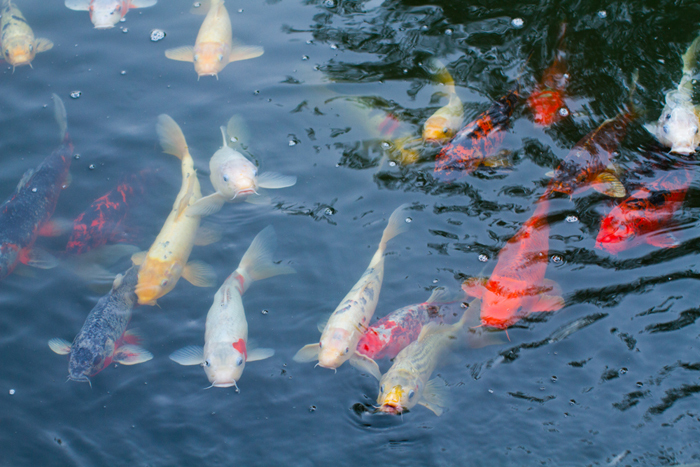 I could sit and watch those fish swim and play for hours, the waterfall babbling in the background, a soft breeze sweeping over the manicured grass, granite lanterns sitting tall, and quiet rooms all around. I was amazed at how much peace and quiet there is to be found here. With so many staff members you would think you would see them walking around more. 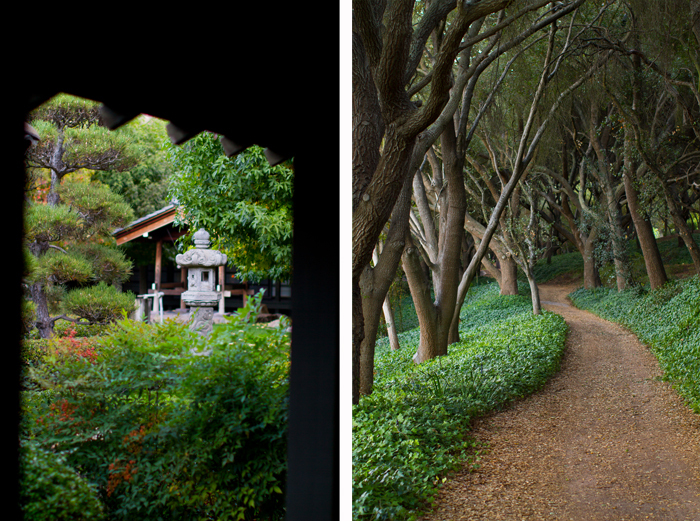 But it is so nice to walk those long wooden halls in complete tranquility – rarely seeing staff or even other guests. I received my departure items – a freshly baked loaf of bread (how cool!) And a few more goodies to send me on my way. Including Golden Door facial and bath care products. 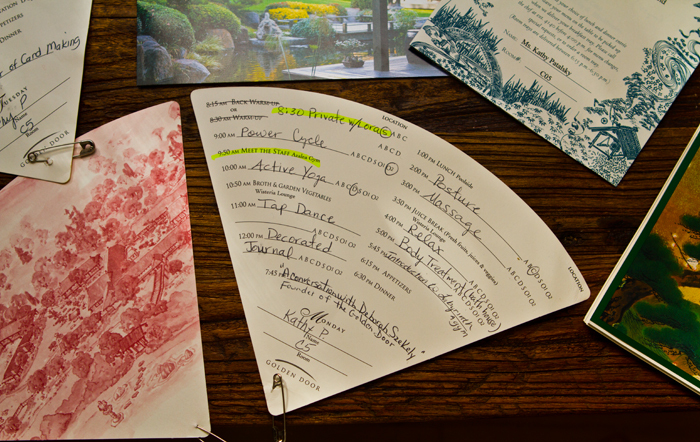 Your exit ceremony at Golden Door is one of magic. You are warmly shuffled out the door feeling as light as air. 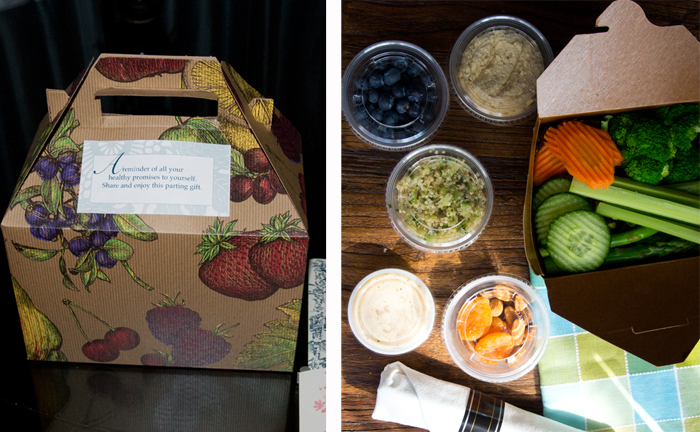 You even receive a to-go lunch packed to your dietary preferences. As I walked by a few fitness staff members they gave me giant bear hugs when they learned I was leaving. A bottle of water was handed to me on my way out as well. Take-Home Lunch. It was SO nice to eat after my long drive home!.. When I first entered the door I was expecting to be wowed at first glance. But in truth, that is not how it works here. The magic of this place takes time to sweep over you. And the end of your first day all the expectations and stress you had when you entered have vanished. 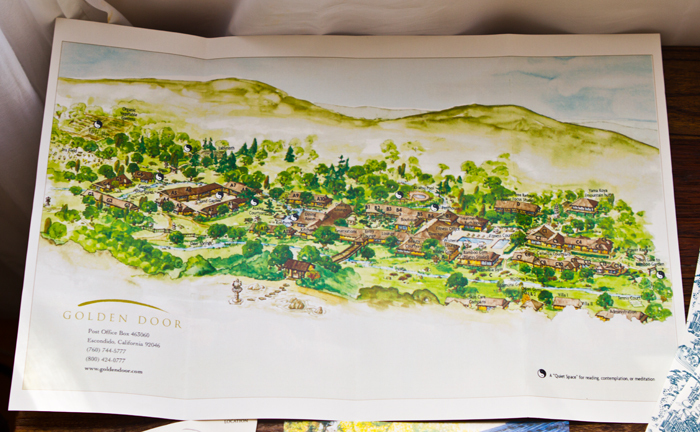 So if you are lucky enough to visit Golden Door, do not rush the bliss. Just wait and it WILL come. Sometimes it takes time to shed your anxieties from the outside world. 1. Follow the sun. Wake earlier, sleep earlier. 2. Make tea-drinking a habit! After meals and late-afternoon tea times help to warm, hydrate, calm hunger cravings and ease digestion. Not to mention the many tea antioxidants available to you. 3. Try new things when it comes to exercise. And have fun with fitness. From Zumba to tap dancing – fitness CAN be fun. 4. Eat slowly. And dine when you eat. Practice mindfulness with each bite. 5. Embrace your adventurous spirit in all you do. Fear nothing. Try everything. 6. Fruit. Veggies. Fruit. Veggies. Add them to your meals, snacks and eat them all day long. They are the healthiest foods on earth! Dig in. 7. Just MOVE. Whether you are taking out the garbage or taking a cardio class. Find time in your day to move the amazing body you were given. Get that heart moving and oxygen flowing. Moving more WILL give you more energy and improve your mood and metabolism. Just move, move, move. Thank you Golden Door for hosting me as a 3-night stay guest. Note, this is not a sponsored post. All opinions and comments are my own. Detailed menu options are distributed daily..